It’s vacation time and you want to take your faithful Lab with you. Can your Lab travel on vacation with you? Of course, he can. 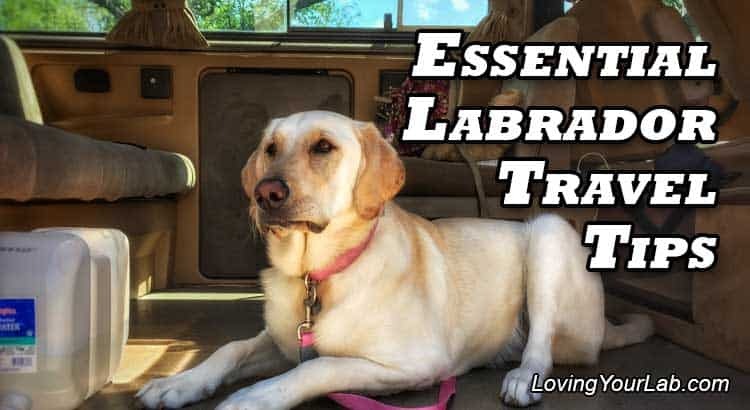 Labs can be great travel companions with a little preparation and planning. If you want to take your Labrador with you on vacation there are several things to consider. You don’t want to set out unprepared so here are some travel tips to keep in mind. Vaccinations. Make sure your pet’s vaccines are up-to-date. Some states may require proof of this, especially for rabies vaccinations. Some destinations may require health certificates as well. Make sure you have all necessary documents before you travel. Your dog should also be on heartworm medication to prevent him from contracting this if you travel to a place where heartworm is an issue. Flea and tick medication. You should have your Lab on flea and tick medication. The last thing you want is for him to come home with an infestation of fleas or with health issues resulting from tick bites. ID tag and chip. Make sure your Labrador has an ID tag with your phone number on it so that you can be contacted quickly if he gets lost. If your dog is chipped, make sure you carry his microchip number with you for identification purposes. Pet-friendly lodging. Check ahead to make sure you can find pet-friendly lodging. Make sure there are motels, campgrounds, etc., that allow dogs to stay there. Make sure you look over all of the restrictions. For example, some motels may only allow dogs under a certain size or weight. Some campgrounds may only allow dogs in certain areas of the facilities. Food. Bring your dog’s food with you. They may not sell his particular brand where you are going, and you don’t want him to have an upset stomach while traveling. Bed and toys. Try to bring your Lab’s bed and a few toys with you. Familiar things from home will help him adjust more quickly to new surroundings. Cleaning supplies. Bring clean-up supplies with you. Always clean up after your dog relieves himself. Many places require it and it’s rude and inconsiderate not to. You may also want paper towels and cleaner in case he gets motion sickness along the way. Leash. Always keep your Lab on a leash when you are out and about. Rest stops and campgrounds may seem like perfect areas to let him run freely but there are several ways he could get hurt or startle other people. Pet-friendly stops. Don’t make plans to stop at places that aren’t pet-friendly unless your Lab has somewhere he can stay, like a kennel. You should never leave him in the car while you eat at a restaurant or go to an amusement park. He will get overheated and dehydrated if left in the car for too long. Basic commands. It’s a good idea for your Lab to know some basic commands before he travels with you. Learning come, stay, and heel will help him to be better behaved and more easily controlled when in unfamiliar situations. Road trips with your Labrador can be quite enjoyable for both of you. Whether you are heading out to camp and hike or just for a bit of rest and relaxation, hitting the road together can be a fun experience. However, it is important that you do some planning beforehand. It is a good idea to start getting your dog used to trips in the car gradually before you head out on a long road trip. No matter what age your dog is you can start training him for road trips. Start by taking him on short trips. You can take him with you to run an errand or take him to the park. Make sure you bring him to places he enjoys. If you only ever take your dog to the vet, to the groomer’s, or any place that gives him anxiety, he may be more reluctant to get in the car. Gradually increase the lengths of the trips you take. Over time he will get used to longer periods of time in the car. If you take your dog on an errand make sure it is either to a place that he can go in with you or that you have someone who can stay in the car with him for a few minutes. You never want him to feel abandoned in the car or to get over-heated. Where Should Your Lab Ride in the Car? As I have said before, your Labrador’s favorite place is right next to you. However, in a car, that is not the safest place for him to be. If it is a short trip to the park, and your Lab is good at laying down while in the car, then the back seat is probably fine. Many Labs are quite active and won’t want to lay down even for a short trip. If that’s the case you may want to purchase a pet seatbelt for your dog to keep him safe while he is in the car. It may be tempting to keep him right up next to you in the front seat, but keep in mind how big your Lab is. He can easily distract you while you are driving and inadvertently cause an accident. Plus, if you are hit he is far more likely to get injured if he is loose in the front seat than if he is restrained in the back. The best place for your dog in the car, especially during long trips, is a crate. If he is crate-trained, he is already accustomed to being in a crate for periods of time. If he isn’t, you can get him used to being in the crate at home or by starting out with short trips in the car in the crate. A crated dog usually feels safer and more secure. He can have his pet bed as well as a special toy in the crate with him. Inside the crate, he won’t get thrown off balance and won’t accidentally be a distraction to you while you’re driving. If your dog tends to get anxious when he is in the car then a crate is the safest option for him. If you prefer not to crate your dog then you may want to purchase a mesh or metal car divider to keep him in the back during long trips. This will keep him in his own area so he will be less likely to cause distractions. It will also give him more space to move around. Your dog will need some space to move around while you are traveling. If you put him in a crate make sure it is large enough for him to stand and turn around. Also, do not stack luggage on top of or too close to the crate as this can cause your dog to overheat. If he is in the back seat or a sectioned-off part of the car, make sure he has enough room to be able to stretch his legs and change his position. You need to make sure that the luggage is stored in a way so it can’t possibly tumble onto your dog. It may be a good idea to purchase a storage compartment for the roof of your car to store your luggage, or you can strap it in place inside the car. Another necessity is fresh air. You need to make sure that your dog can feel the air coming in from the air conditioner or open windows. Just because you feel it doesn’t mean that he does. Check the area around him and make sure there is air flowing there. If you leave your dog loose in the back make sure the windows aren’t down far enough for him to squeeze through. If you are driving on the highway he should not have his head hanging out the window. At roadway speeds, he can be injured by debris or strong winds which can damage his eyes, ears, or nose. If the window is open too far he may also be tempted to jump out. Even the best-trained dog may jump out of the car if he sees something tempting to chase. Whether the car is moving or parked, your dog can seriously injure himself by jumping out of it. This is also why he shouldn’t be in the open bed of a truck on road trips. If your dog tends to get carsick there are a couple things you can do to help him with this issue. First, only give him a small breakfast about an hour before you are leaving or wait to feed him until you arrive. Don’t give him food along the way. If your dog tends to get sick in the car it’s a good idea to ask your vet for motion sickness medication. Some Labs may do fine on short drives but have issues on longer drives, especially if the drive involves windy roads. Because of this, make sure to have your dog’s motion sickness medication on hand. As your Lab gets older you may still want him to travel with you and he will still love to go. Keep in mind that he will probably require a little more care than he did when he was younger. Older dogs may need to urinate more frequently. You will need to stop often to let him stretch his legs and relieve himself. Your older Lab may also have more problems getting in and out of the car than he did when he was young. You might want to think about buying a dog ramp to make this easier for him to exit and enter the car. Constantly having to lift him could injure you as well as him. A ramp can make the whole process easier for both of you. Puppies actually require similar care. Their little bladders don’t hold much so they will need to stop to urinate frequently. A puppy will also require play time to work out some of that pent-up energy. Long car rides can be tough for energetic puppies. Make sure you bring some chew toys for him but make sure they are safe and won’t be a choking hazard. Always keep your Lab on a leash whenever you stop. There can be a lot of cars and people at most rest stops and you don’t want him to run out into the parking lot or to scare people by running up to them. Even if your dog is well-trained off his leash, the courteous thing to do is to always keep him on one. If your dog does happen to run away from you while at a rest stop, don’t panic. Chasing your dog is the worst thing you can do. He may think you are playing and will run away from you to continue the game. Or he may think he’s in trouble and run away to avoid it. The best thing to do is to calmly sit down and call him to you. Enticing him with a treat is a good idea too. You should carry a first aid kit for your dog when you travel. Ask your vet for recommended supplies to have on hand for basic cuts, motion sickness, etc. Always carry your vet’s phone number with you so you can call for advice if your dog gets sick while traveling. When you stop, never leave the dog in the car for more than a few minutes, even with the windows rolled down. Temperatures can rise in a car quickly. Bring clean water with you. You should stop every two hours or so to hydrate your dog and to let him take a bathroom break. Make sure you keep him well hydrated during travel. What about those instances when you need to travel by air? Good news! Your Labrador can still go. Several airlines allow your dogs to travel with you, just make sure you plan ahead and take care of all necessary requirements. Unless your Labrador is a service dog, he will not be allowed to fly in the cabin with you and will need to travel in a crate in the cargo hold. Most airlines require you to provide a large, plastic crate for your Lab to travel in. Each airline has their own specifications so it’s a good idea to call or go online and see what they require. You don’t want to purchase a crate and then find out it doesn’t meet the airline’s requirements. They usually want the crate to be large enough for your dog to stand up and turn around. They may also want to make sure there is room for a food and/or water bowl in the crate with him. Make sure you write your name, phone number, departing address and destination address on the crate in felt pen. Place a nice, soft blanket in the crate to help keep your Lab comfortable. Make sure you give him plenty of exercise and a chance to relieve himself before you put him in the crate. Try to stay with the crate until it is taken to loading. Make sure you give yourself plenty of time to plan your trip and make reservations. Most airlines that allow dogs to travel with you have several restrictions that you need to keep in mind. All airlines require a proof of rabies vaccination and a health certificate that has been issued within the last 10 days prior to your flight. You will need to make sure his shots are up to date and that you have time to get him into the vet to get the certificate filled out. Many airlines require that you call to make reservations when flying with your dog instead of booking online. They can usually only allow a certain number of animals on each flight. Call early to make your reservations if you want to make sure you get on a specific flight. Try to book a non-stop flight if possible. It’s better not to take the chance of your dog being accidentally moved to the wrong plane or having to be held in a cargo hold for too long. Some airlines have specific rules about arrival times and unloading procedures. Make sure you have all the information you need from the airline. During the summer try to fly at night when it’s cooler. Some airlines may not allow an animal to travel at certain times of the year. If there are concerns that the cargo area can get too hot or too cold for the animal then travel won’t be allowed. Should I Tranquilize My Dog for Travel? The American Veterinary Medical Association (AVMA) recommends that you shouldn’t use tranquilizers for your dog when he is flying. Some tranquilizers can cause respiratory problems when combined with the pressurized environment of the cargo hold. Also, a sedated dog could lose his balance more easily when being moved around and injure himself. If your dog tends to be overly anxious, discuss all options with your vet. If you both decide that a sedative is necessary, make sure you write all the drug information on the crate. Make note of the name, dose, and time it was administered. You should also make sure that the staff is aware that the dog has been sedated. You may be required to keep a muzzle on your dog at the airport until he is placed in the crate. The best type of muzzle to purchase is one made of strong leather and that has a strap that goes across the forehead. If you are traveling with your dog to a foreign country or an island like Hawaii additional paperwork may be required. If you are traveling to a rabies-free island they may require that your dog have a rabies titer. According to healthline.com “the antibody titer is a test that detects the presence and measures the amount of antibodies within a person’s blood. The amount and diversity of antibodies correlates to the strength of the body’s immune response.” In other words, it determines if your dog has enough of the right antibodies to protect himself from rabies. If he is vaccinated this shouldn’t be an issue. Island destinations may also require that your Labrador is put into quarantine for a short amount of time when he arrives to make sure he is clear of any diseases, like rabies. If you are worried about flying with your Lab, you can always consult a pet travel agency. There are several of them out there. Read reviews, do your research, and find one that is reputable and well-liked by other pet owners. 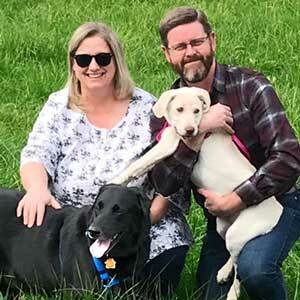 They can help to ensure you meet all the regulations regarding pet travel and can sometimes even help you with health certificates and reservations. Which Airlines Allow Dogs to Travel in the Cargo Holds? In the United States, there are four carriers that I know will carry dogs in the cargo hold- American, United, Delta, and Continental. This article from USA Today has more information about this. How Much Does It Cost for My Lab to Fly in the Cargo Area? This all depends on several things: the airline, the distance traveled, and sometimes even the size of the dog. Prices can range anywhere from $125 to around $500 one-way. How Do I Find Dog-Friendly Lodging?